So I’ve noticed I have a tendency to get a little off track when making what everyone says are very simple items (my black tshirt with the fancy neckline springs to mind). Somehow in my mind it seems that if I’m attempting a simple pattern, even if it’s the first time, it’s reason alone for trying some fancy other stuff at the same time. I find myself mid project wondering if that light at the end of the tunnel is getting closer or further away, asking myself if what I’m currently torturing may, in the end, even be wearable. I had just such a moment today while looking down at a bunch of fabric pieces wondering whether an elasticated waistband, false placket and gathered pockets was really all necessary on a pattern I hadn’t yet attempted. Luckily I had patience and chocolate on my side. What you are about to witness is a very long-winded tutorial. You may get to the end wiser about how to make something simple so very complicated. Or perhaps you’ll get to the end and wonder ‘What was that girl thinking?’. 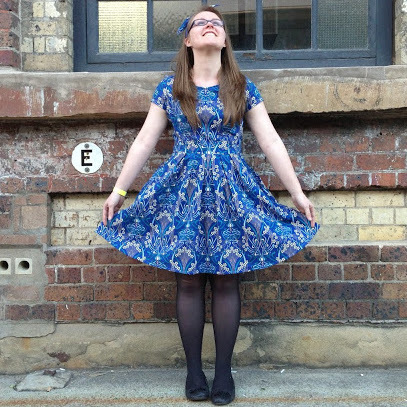 Either way this post shall be a testament to a skirt that swallowed an entire summer afternoon. Firstly I need to say this is my made up version of making a skirt so if it’s in an order that doesn’t work for you go right ahead and change whatever you need to! You will need 1 metre of fabric, buttons, elastic, safety pin, thread, scissors etc. Decide on the dimensions of your skirt. I decided on the sizes below on a whim and it worked out pretty well. First sew the front and back skirt pieces together right sides facing. Sew the waistband front and back pieces together right sides facing. I used pinking shears to finish off the edges after taking this photo. 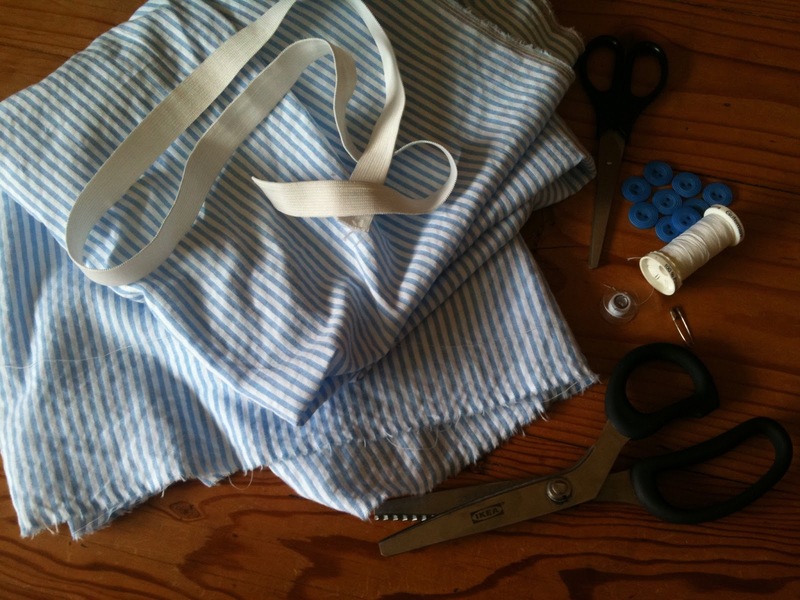 Fold the waistband in half lengthways and pin around the whole skirt on the right side. 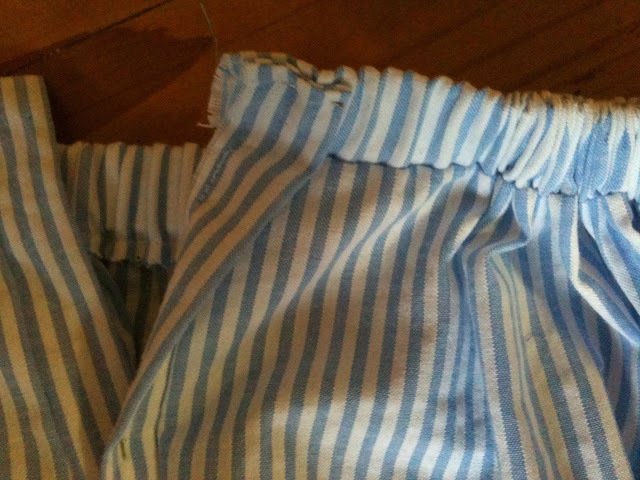 Mark and cut the centre front of the skirt to insert your placket. For each placket piece fold lengthways with the wrong side on the outside and sew 1cm in from the end. Turn it out to the right side, fix up the corner and fold lengthways again before pinning along the right side of the centre front cut. Sew both plackets from the hem to beneath the waistband but do not sew across the waistband. We’ll be coming back to put elastic in the waistband soon. 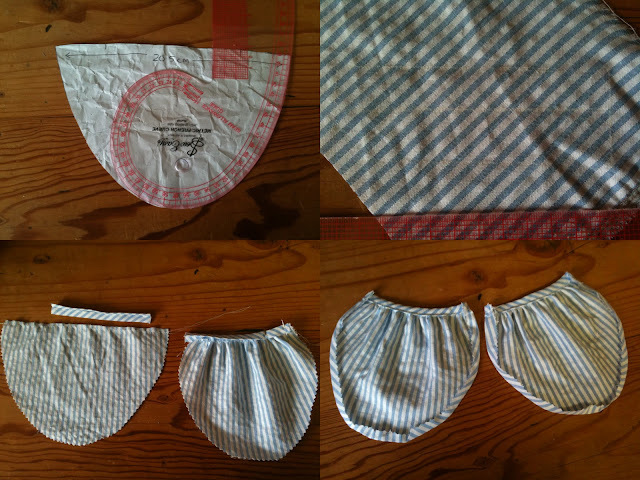 Pin the plackets together (like they will look once they have buttons on them), measure, pin and sew your hem. Next it’s time to put the elastic in. Put your safety pin through your elastic and feed it through the entire waistband. You may want to anchor the other end by pinning it to the outside fabric so it doesn’t slip inside too. I’ve made that mistake before! I tried the skirt on at this point to make sure the elastic was the right length around my waist. It wasn’t. I ended up cutting off abut 15cms before the next step. 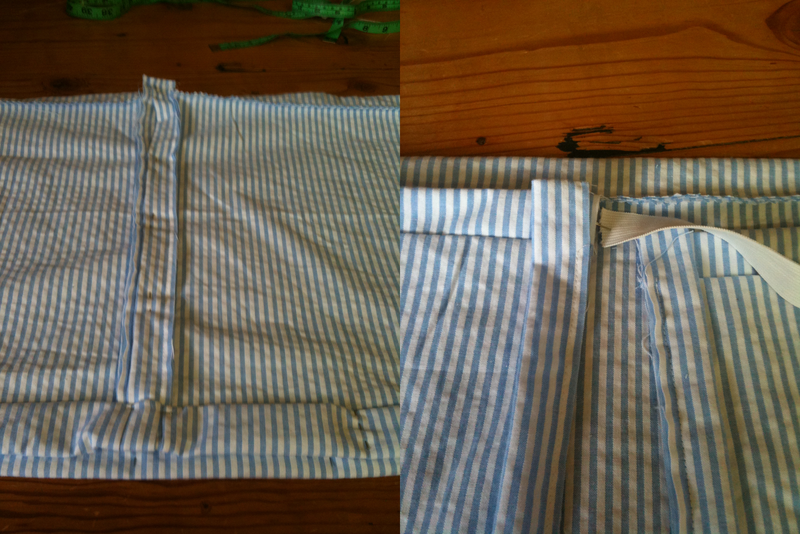 Once you have your elastic the right length you can pin it to the edge of the waistband and the placket like so. Then sew it up. I sewed across this a couple of times because it will take stress when wearing it. Terrible photo really, if you squint and use your imagination you can almost see that the elastic is pinned neatly there ready to be sewn. 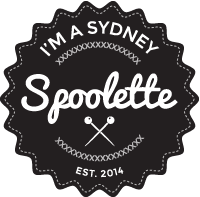 Now it’s time for the pockets! I followed this great tutorial by ikat bag I found here. So here’s a condensed version of the same thing only done by me. Somewhere in here I tried the skirt on again to see where I wanted the pockets to sit and pinned them on while I was wearing it. Topstitch them on. Now this is the step for those of you who may be clever enough to actually do button holes. Go right ahead and do your magic. I’m too scared to try them yet so instead I pinned where I wanted my buttons to sit and hand sewed them right onto the placket. And voila! 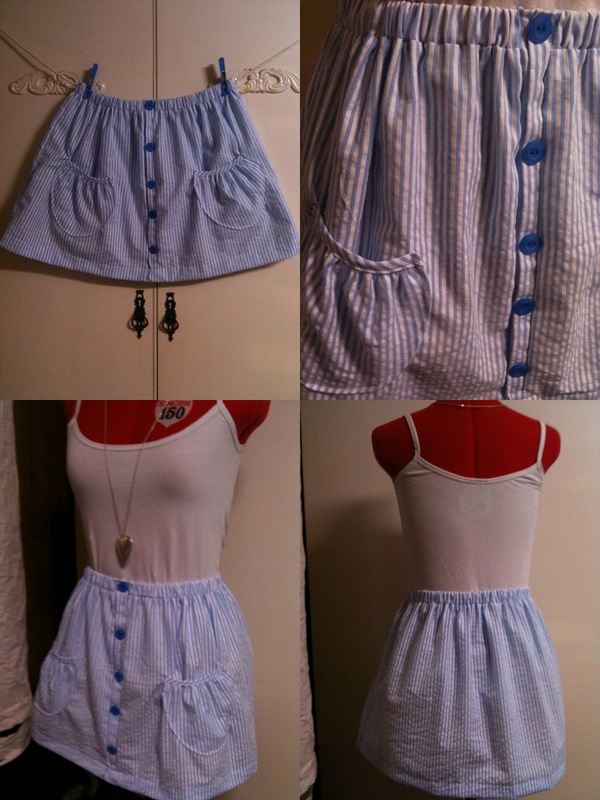 One simple-ish skirt for summer! That was worth the effort, your skirt is beyond cute!